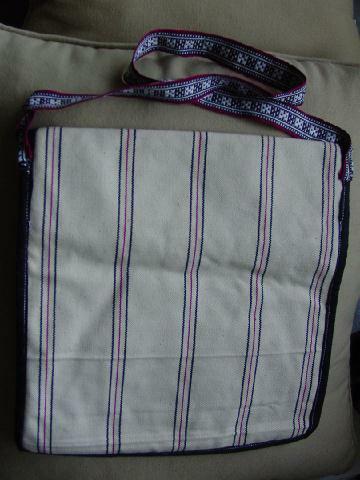 This handcrafted foreign-made (we don't know which country) never-used purse has antique white thick fabric (feels like ticking with black and red vertical zizag lines. 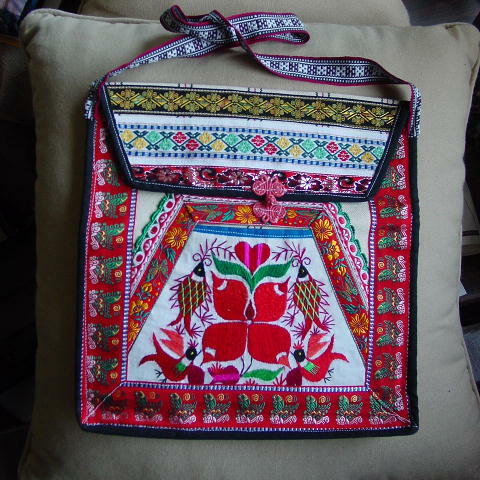 It has a 1 5/8" wide red fabric trim on three sides in the front with green, white, and yellow embroidery. The front center has an angled red trim with embroidered teal and curry butterflies, flowers, and leaves. Its border is in red, white, and green. the white fabric center has embroidered fish, birds, flowers, etc. in wine red, green, orange, yellow, and hot pink. The top flap closure is in a pink-coral, and the flap has embroidered horizontal panels in red, yellow, green, blue, black, and metallic threads. There is a 3/4" wide by 27" long fabric strap. A model got it as a present from a photographer.